The Sagarmatha playground gets a new look! In November, the Yishun Town Secondary (YTS) School from Singapore came to visit Umbrella. 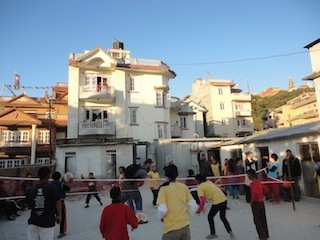 In September, the side wall of the Sagamartha playground had fallen over during heavy rains and the playground was in a general state of disrepair. Therefore, a rejuvenation project was undertaken to overhaul the playground. 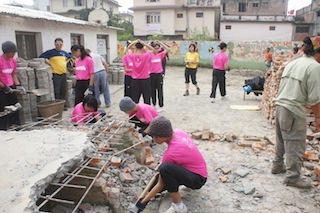 A clearance of the bricks was completed by the older Umbrella boys and volunteers, before the YTS school’s arrival. Then, the YTS school came, they rolled up their sleeves, sweated their brows and worked very hard to clear out the grounds, re-build the wall, lay a playing surface, set up Basketball, badminton, table tennis courts and re-decorate the activities room for all of our kids to enjoy! It was amazing work by the guys from YTS school and it was all done within the space of a week!